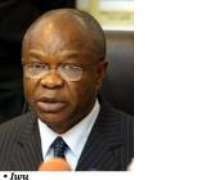 The Chairman of the Independent National Electoral Commission, INEC, Professor Maurice Iwu, has said only the military can conduct free and fair elections in the country. The INEC boss spoke Thursday at a public hearing on a bill to establish a Commission to register political parties in Nigeria. “If we had dictatorship, we would have a free and fair elections; the elections that Nigerians have endorsed and craved for, were organised under the military. The fact that it was organised by the military makes it undemocratic. “Democratic elections are never flawless. They have problems. And we have to be able to know that the whole process of democratisation includes the noise. Includes all that we are here for, and we should bear that in mind”, he said. The Chairman of the National Conscience Party, NCP and the President of West Africa Bar Association (WABA), Mr. Femi Falana, said unless the Constitution and the INEC is “completely” independent of political manipulations, there would never be free and fair elections in the country. He regretted that Nigeria has continued to be a byword for fraudulent elections in Africa and the world. “Elections in Nigeria have become a perennial source of colossal embarrassment for the country. Nigeria has become a reference point in the world, when it comes to bad elections. I, therefore, appeal to you, to put sentiments apart, and save the country, so that democracy can be strengthened, because if what happened in 2007 is repeated in 2011, we pray that we do not go into war. “If the electoral body so structured cannot conduct election in 1/3 of a state like Ekiti, you can imagine what will happen in 2011. Ten thousand soldiers were deployed, not to talk of percentage of soldiers deployed. Imagine doing that in 36 states at the same time, we are asking that this amendment we are proposing be accepted,”he added. Falana, who used Ghana as an example of credibility in the electoral process, recalled that the country's ex-President, Mr. John Kuffor, could not manipulate the process to sponsor his candidate even when he was leading by 47.3 per cent (just a little short of the 50 per cent requirement) as against his opponent's 43 per cent, the president didn't summon INEC “to help” with the results.